The International Geodetic Students Meeting (IGSM) is the annual meeting of the students of the member schools in the International Geodetic Students Organisation (IGSO). 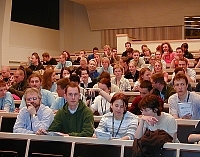 The annual conference is organised by one of the member schools. The 17th conference was organised at the Helsinki University of Technology (HUT) in Espoo, Finland 7-12 June 2004. At the moment IGSO has 70 universities and schools as members from 27 countries. The conference in Espoo attracted almost 150 students from 20 countries, but finally some participants from developing countries have to give up because of problems with visas. The conference was hosted by the Department of Surveying at the HUT and the Guild of Surveyors. The opening ceremony included welcome greetings from the Ms. Tanja Karpela, Minister of Culture, Mr. Olavi Nevanlinna, Vice Rector of HUT, Mr. Olavi Louko, City of Espoo, Prof. Kauko Viitanen, Head of the Department of Surveying at the HUT, Tiina Kauppinen, Chair of the Guild of Surveyors and Mr. Markku Villikka, FIG. In her welcome greeting Ms. Karpela focussed on the proposal of getting the Struve Arc to the UNESCO World Heritage List which will be the first technological site in the prestigious listing. The Finnish government together with other Struve Arc countries have made a formal proposal to UNESCO, she also expressed her thanks to surveyors and FIG who have contributed in this process. 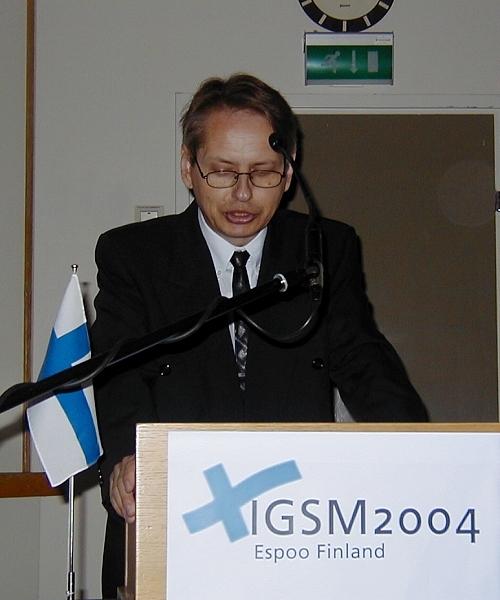 The organising team of the IGSM was lead by Mika Eskelinen, IGSO Secretary General and Seija Vinblad, IGSO Treasurer. The programme of the conference included technical sessions, technical excursions and social programme with soccer, sauna, sea and ... dinners. 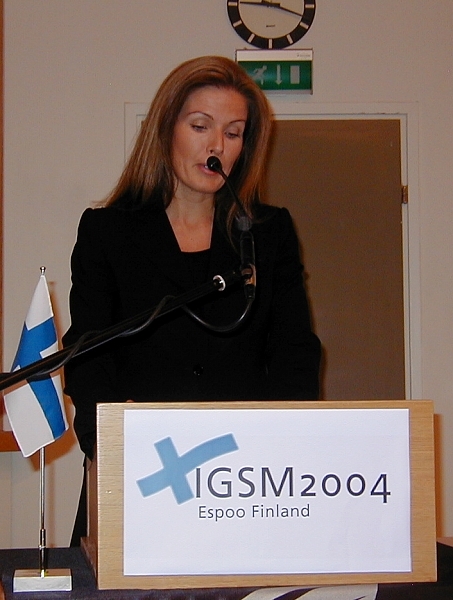 On Friday 11 June there was the General Assembly of IGSO. 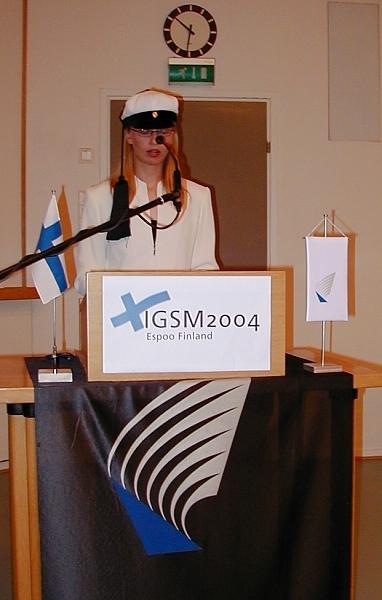 This was the second time when FIG was co-sponsoring the IGSM. The first time was last year when the meeting was organised in Dresden, Germany. The meeting in Espoo also offered good opportunity for IGSO and FIG to discuss future co-operation with events and promotional co-operation. FIG has also committed to co-sponsor the 18th IGSM to be held in Istanbul in 2005. 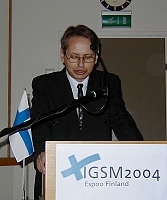 Welcome address of Markku Villikka, Director, FIG office in .pdf-format. 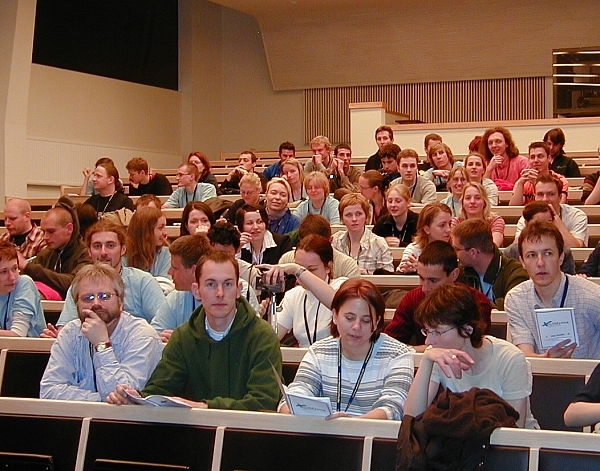 More than 120 students attended the 17th IGSM at the HUT in Espoo. Invited quests at the opening ceremony: Tiina Kauppinen from the Guild of Surveyors and Tanja Karpela, Minister of Culture. The organising committee welcoming the international guests. Minister Tanja Karpela giving her welcome greeting. Prof. Kauko Viitanen, Head of the Department of Surveying told about the impacts of the Bologna process to the surveying education in Finland. Ms. Tiina Kauppinen told about the activities and traditions of surveying students in Finland.